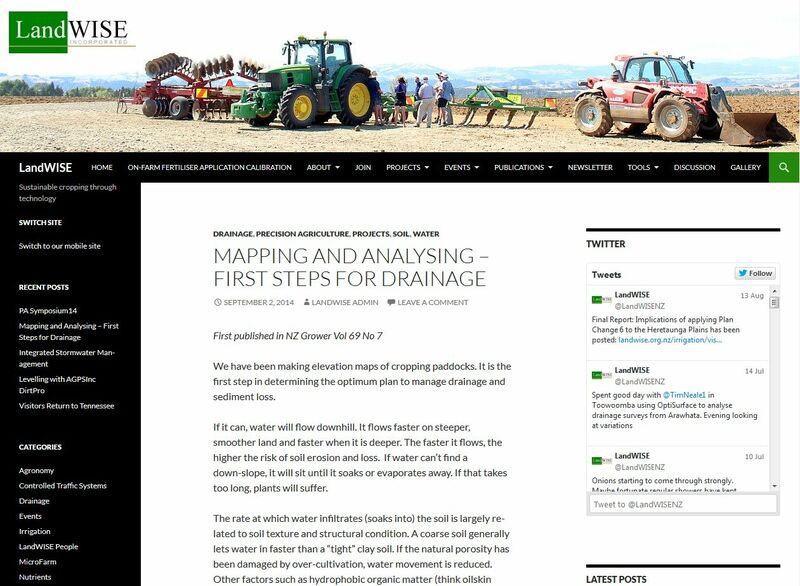 OptiSurface in Press: "Landwise Inc. - Mapping and Drainage Analysis" – Welcome to the OptiSurface Support Center! We have been making elevation maps of cropping paddocks. It is the first step in determining the optimum plan to manage drainage and sediment loss. If it can, water will flow downhill. It flows faster on steeper, smoother land and faster when it is deeper. The faster it flows, the higher the risk of soil erosion and loss. If water can’t find a down-slope, it will sit until it soaks or evaporates away. If that takes too long, plants will suffer. The rate at which water infiltrates (soaks into) the soil is largely related to soil texture and structural condition. A coarse soil generally lets water in faster than a “tight” clay soil. If the natural porosity has been damaged by over-cultivation, water movement is reduced. Other factors such as hydrophobic organic matter (think oilskin raincoats) also stop or reduce infiltration. Step two is using a computer to analyse our detailed elevation maps and determine where water will pond and how deep it will be. Knowing how much land is affected lets us gauge the cost of ponding. We can “apply” a rain event and see where the water runs, how deep and how fast. This lets us identify, and make plans to manage, erosion risk areas. The third step is creating plans to remove water in a controlled way; not too fast and not too slow. For many years this has been done by laser-grading. This creates a flat plane with a set slope so water can drain at a set rate across the land. Unfortunately it often requires a huge amount of soil movement. 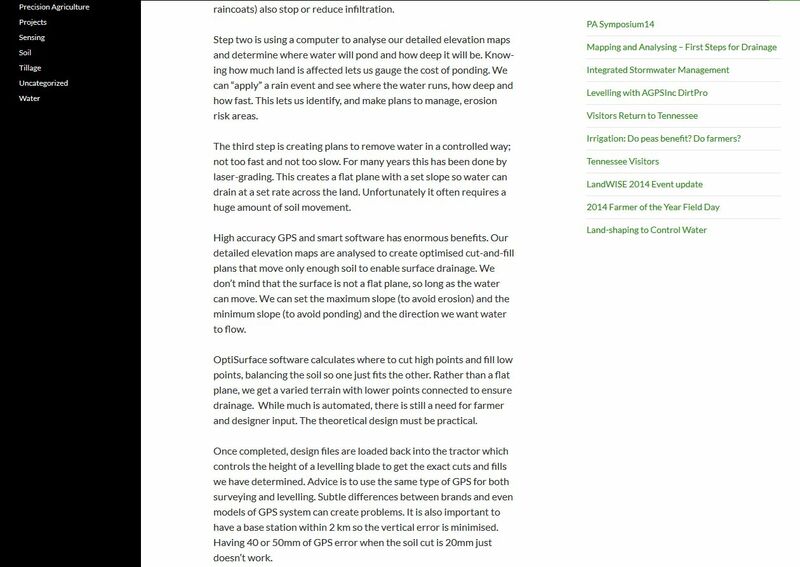 High accuracy GPS and smart software has enormous benefits. Our detailed elevation maps are analysed to create optimised cut-and-fill plans that move only enough soil to enable surface drainage. We don’t mind that the surface is not a flat plane, so long as the water can move. We can set the maximum slope (to avoid erosion) and the minimum slope (to avoid ponding) and the direction we want water to flow. OptiSurface software calculates where to cut high points and fill low points, balancing the soil so one just fits the other. Rather than a flat plane, we get a varied terrain with lower points connected to ensure drainage. While much is automated, there is still a need for farmer and designer input. The theoretical design must be practical. Once completed, design files are loaded back into the tractor which controls the height of a levelling blade to get the exact cuts and fills we have determined. Advice is to use the same type of GPS for both surveying and levelling. Subtle differences between brands and even models of GPS system can create problems. It is also important to have a base station within 2 km so the vertical error is minimised. Having 40 or 50mm of GPS error when the soil cut is 20mm just doesn’t work. 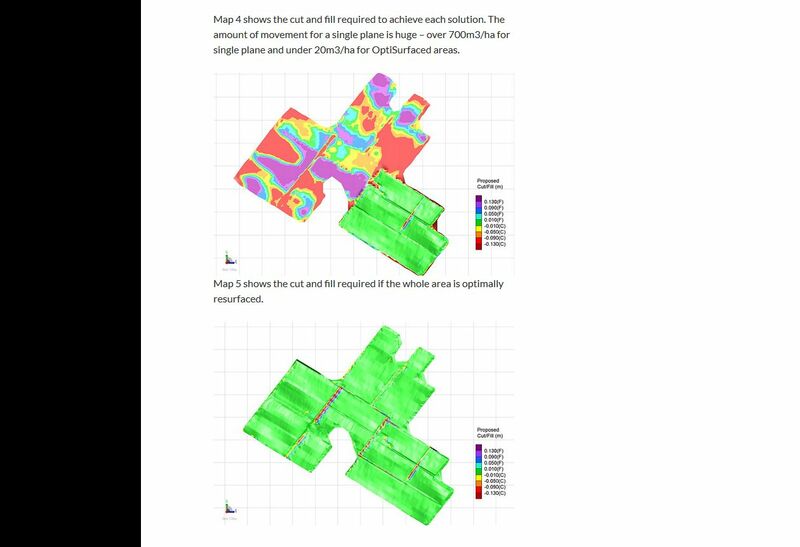 The series of maps cover a case study 40ha cropping property. We mapped it using the farmer’s Trimble FmX and analysed the data in OptiSurface. Map 1 shows the existing topography on the farm, each colour change being a 1m change in elevation. Map 2 shows where water will pond, and how deep it will get. Next we looked at some solutions. Map 3 shows the possible topography if part was levelled to a single plane (purple through green strips) and part was OptiSurfaced (green through red strips). Map 4 shows the cut and fill required to achieve each solution. The amount of movement for a single plane is huge – over 700m3/ha for single plane and under 20m3/ha for OptiSurfaced areas. Map 5 shows the cut and fill required if the whole area is optimally resurfaced.